Looking for fun frugal Halloween decor that you can make yourself or with your kids? Check out this cute Spooky Spider banner! This post contains affiliate links. Most people are terrified of spiders, but around Halloween time, you just can’t decorate without them. They are so creepy, so crawly, and add the perfect touch of Halloween charm. 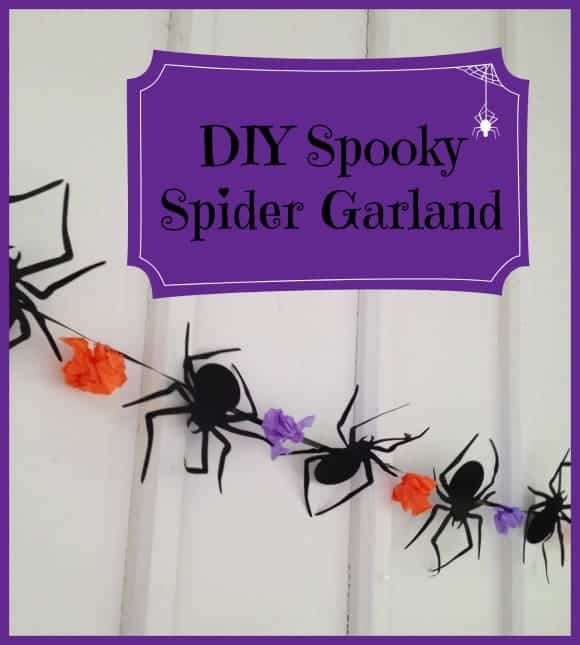 If you are looking for some fun and frugal ways to decorate your home this Halloween season, why not give this Spooky Spider Banner a try? It only takes a few items to create it, and all of the items you need can be purchased at your local dollar store. Take a peek below at how to make your own, and in no time you can have these creepy crawlies all over your house. But don’t worry, these ones don’t bite! You can purchase everything you need for this frugal Halloween decor craft at your local dollar store. For our sample picture, we bought the cut outs in the Halloween section at Dollar Tree. You get about 12 in a package for just $1. This is a really a craft you can create on a dime. First, cut pieces of tissue paper into small squares. You will then bunch these squares up and pinch in the center creating small puffs. You can also create pom poms by folding the layers in a fan and fluffing them out like you do to make tissue paper flowers. Set aside. Now, you can begin arranging the spiders on your string or ribbon. They all don’t have to be hanging in the same direction. You can have them facing all different directions to give them some life and variety. Add a dab of glue to the back and press firmly to the string or ribbon. Make sure you press until it is well adhered. You can now start adding the pom pom accents in between each spider. This will give the banner some interest. Take your chalk ad write one letter on each spider. You can spell SPOOKY, or BOO, or any other word you wish. Once all of your pieces are attached, it is time to hang this hauntingly charming piece! Put it anywhere your home can use some festive decor. A mantel or stairway is ideal. You can make this banner as long or as short as you wish. Add other elements that appeal to you such as glitter if you are so inclined. This is a such a fun and easy craft, you can easily whip one up to add color to a small space or anywhere else you need an extra touch. The best part is, you don’t have to go broke creating it! A simple trip to the dollar store is all it takes. 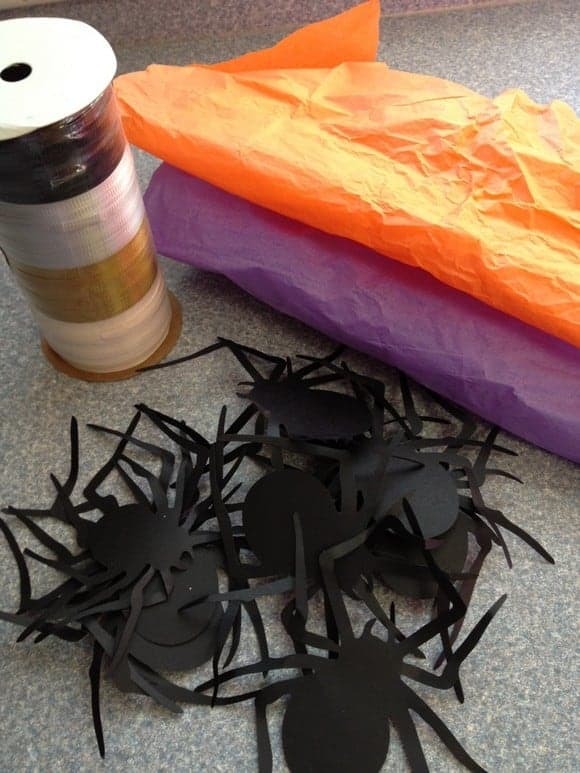 Don’t let the Halloween season pass you by without making this Spooky Spider Banner. Even if you don’t like spiders, you can’t beat the cuteness or the thriftiness of this craft. Gather your supplies and see what you can come up with! Looking for another easy frugal Halloween decor idea? Check out our brown bag pumpkin craft! oh my, I will freak out..
Wow! This is the best DIY spiders ever! Very cool! EWWWWW! I love Halloween but I never decorate with spiders. I’m afraid the real ones in my neighborhood will come visit! This is so cute, you did a great job!